Butterbeer cannot be purchased outside of The Wizarding World of Harry Potter. The Wizarding World offers three varieties of Butterbeer: regular, frozen, and hot. Regular Butterbeer is a thick, cream soda-like drink with a creamy, butterscotch froth. The frozen version is more like a slushy and also includes a generous helping of the froth. The hot version is a smooth and creamy drink, with the froth on top. Prices for Butterbeer are not published and frequently change. Most recently, regular, frozen, and hot Butterbeer costs $7.49 plus tax. Guests can purchase an optional Butterbeer “stein” with their drink, bringing the total to approximately fifteen dollars. Butterbeer Fudge, a recent invention, is available fresh at the Honeydukes treat counter. The “hot Butterbeer” variety recently introduced in Orlando has made its way to Hollywood, and offered year-round. 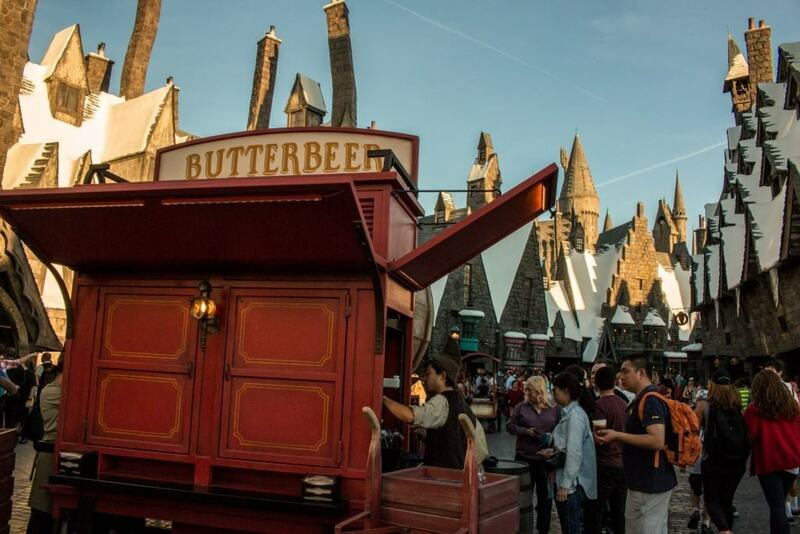 Butterbeer Ice Cream, a hard-pack option, is available in the West Coast Wizarding World. In our opinion, no visit to the Wizarding World of Harry Potter is complete without at least trying Butterbeer. We at California Informer prefer the frozen variety, a welcome respite on a hot Los Angeles day, but both versions are delicious. If you aren’t sure if you’ll enjoy the drink, purchase a single cup and share with your party before getting additional servings. The main cart in the center of Hogsmeade typically develops the longest lines, and waiting for the Three Broomsticks often doesn’t make sense unless you intend to purchase a full meal. We recommend grabbing your Butterbeer from the less crowded Hogs Head Pub or the supplementary cart near the outdoor Pictish stage. Keep in mind you can bring your Butterbeer into the Forbidden Journey and Flight of the Hippogriff queues as long as you finish your drink before getting on either ride.